Aldo Colombini's favorite plot is Oil and Water. He has collected literally hundreds of variations over decades of performing magic. He has selected the best and most unique representatives of his collection here in his Oil and Water series of download DVDs. Ten powerful routines on the classic theme. All performed with regular cards. 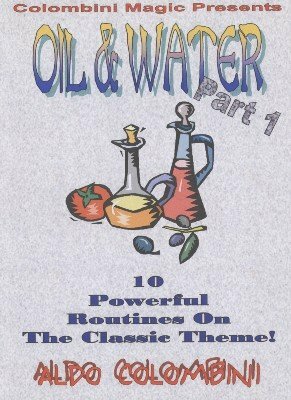 FOURTEEN-CARD OIL & WATER (Nick Trost): An easy routine basically self working. ITALIAN DRESSING (Aldo Colombini): I am biased but this is my favorite oil and water routine. Four phases. OIL & QUEENS (Roy Walton): The routine became a classic and still is! A surprising ending that fools spectators. NEW WAVE OIL & WATER (Val Le-Val): The classic theme performed with ESP cards. The Waves are the water, the Circles (‘O’s”) are the oil. SEPARATIC (Peter Duffie): A different routine using three red cards and three black cards. L’HUILE & L’O (Didier Dupré): A very fast and direct routine by our friend from France. VERY NICE OIL & WATER (Richard Vollmer): A four-phase routine where at the end all the cards become one color. SIMPLE OIL & WATER EFFECT (Carroll Mounier): The name says it all. A quick routine in two phases. SUPREME OIL AND WATER (Mike Bornstein): A strong routine with different colored cards (the red cards have red backs and the black cards have blue backs). Several phases with repeated climaxes. OIL AND WATER (Stewart Judah): A simple routine using three red and three black cards! All performed with regular cards.